I have nothing new and completed to share. Since I don't like to make a post without a picture, I'll show a face that's waiting for a body. Hubby is making a good recovery from his accident. The hospital overlooked a glass shard stuck in his forehead, so he did a little "self-surgery" to remove it. I change the dressing on his hands every day. We ran out of the small sterilized gauze pads, the gauze wrapping and white tape that he bought on the day of the accident. I had to improvise with what we had on hand (no pun intended). I cut up large gauze pads which I applied directly on the wounds. Instead of gauze wrap, I cut some pink J-cloths strips on the bias to wrap around the pads to hold them in place. Then I taped the gauze up with some heavy duty flesh coloured band-aids. It doesn't look very professional, but it gets the job done. For the last three days, due to heavy snowfall and hubby's impairment, I have had to go out and do all the shovelling of snow and clearing the windows of the van before hubby headed out for work. Actually, it's been fairly mild and very pleasant outdoors amid the beautiful winter wonderland. Before he left today, in recognition of what a good and efficient job I've done with displacing all that snow, he asked me to "1) split the remaining firewood, 2) feed the chickens and 3) knit me a sweater before I get back home tonight". This is a sample of the teasing I have to endure with this man, God love him. BTW, we have no chickens and I haven't learned the art of knitting yet. And on a serious note, my sister and I remember our father who passed away a year ago today, November 28, 2007. This is what I am seeing from my front window today. The giant tamarack is coated with snow. Hubby took this shot. He is at home, resting and getting over the shock of an unfortunate accident yesterday. He was carrying some boxes into a customer's store. There was a crack on the sidewalk in front of the shop, with one half of the crack an inch higher than the other half. He tripped and crashed into the plate glass window. The window shattered and cut him in the forehead, on both wrists, on the little finger of the left hand and his knees took a beating too. Poor guy had to be taken to the hospital in an ambulance to get stitched up. He is alright and considers himself very lucky that there were bars behind the window or else it could have been a lot worse. Here's my latest doll. This one has lots of embroidery, most of which, you cannot see in this photo, even if you click on it for the enlarged view. I followed the vertical lines of the body with some gold metallic thread so it shimmers in the light. It's my first experience with metallic thread and I don't like it very much. I like the sparkle but how are you supposed to work with this three-ply thread? It's a real struggle to thread a needle. I finally gave up and used a single strand. 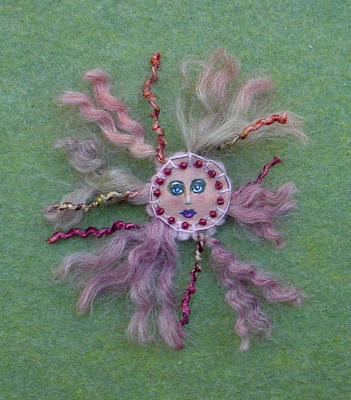 Even then you have to be careful because each single strand is some kind of a metal fibre wrapped around a weak cotton or acrylic fibre. It's not very flexible and can easily break. If anyone can enlighten me, please let me know. 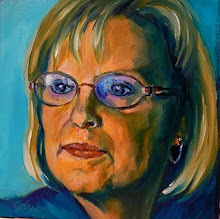 Jacky of Art4Moi is quite a creative soul and more than once I have been inspired to try my own version of her work. 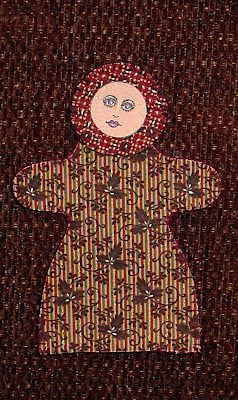 She is a devotee of artist Gustav Klimt and makes "Klimt Dolls". 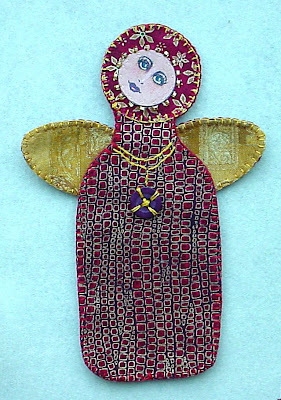 Have a look at her recent Klimt Christmas Angels. I liked hers so much I thought I'd make one too. 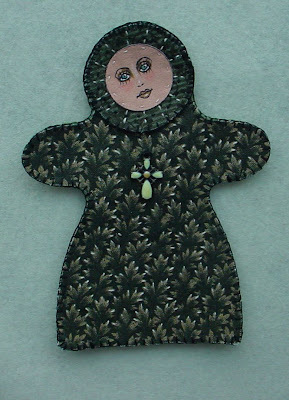 This little doll is one of my favourites so far. It's a birthday gift I made for my good friend and glass artist Julia Dawn. I chose green because that's Julia's favourite colour. It looks plain in the photo but there's actually a lot of stitching in this piece. I've highlighted the tips of the leaves with beige embroidery floss. There's also a lot of stitching around the face and the edges are all neatly blanket stitched. More sad news in our family. I mentioned previously that hubby's sister died November 5th. A few days later, my favourite aunt passed away. We attended two funerals in two weeks. It wasn't that long ago that we went to weddings and the odd funeral. Nowadays, we go to funerals and an occasional wedding. The background for this brooch is based on a loose tracing of a very small oak leaf I picked up during yesterday's walk around my country home. It's been absolutely wonderful around here for the last few days with plenty of sunshine and warm temperatures. It looks like today will be the last nice day before the colder weather sets in. 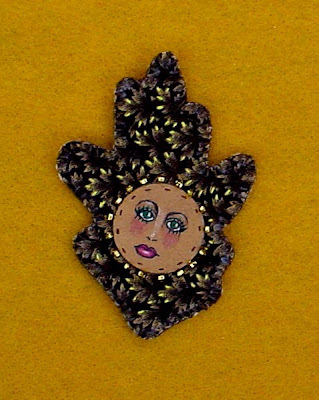 This is a really tiny brooch I made utilizing some beautiful yarn in my stash. I guess I should say a word about the craft show I did a couple of weeks ago. Actually, a word does come to mind but best not say it here. It turned out to be one of those church bazaar type sales with cakes, pies, jams, little knitted things, discontinued Tupperware, etc. The attendance was low due to rainy weather. I basically sat there for five hours, people watching. Not one sale and hardly any interest. It was as if I was invisible. They kept charging by my table to get to the woman next to me who was selling halloween candies and chocolates that she made and packaged up herself. She was raking in the dough. I am just grateful that hubby showed up half way through. He was good company and we kind of sat there and joked about the whole thing - what else can you do? It obviously wasn't the right venue for me. I kept thinking something positive will come out of this and in fact it did. Later that evening, hubby and I went to a Halloween costume party. I met a woman there who makes kilts for a living. She suggested I use tartan fabrics in my dolls to appeal to the Highland dancer crowd. I have some authentic small scale tartan cotton fabric (very hard to find) from my last Scotland trip, but I need more. So seeking out tartan will be one of my missions whenever I'm near a fabric store or thrift shop. 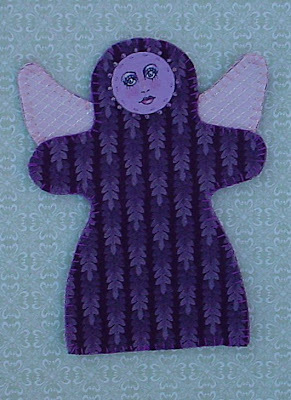 I stitched the above Purple Angel last night. This morning we learned that my sister-in-law, hubby's sister, passed away. This little angel is for you, Isabelle. The winner of the Icicle Doll is Summerset. Please Email your address to me at mandolin50 at hotmail dot com.